In October 1998, a twenty-one-year-old student at the University of Wyoming was kidnapped, severely beaten and left to die, tied to a fence in the middle of the prairie outside Laramie, Wyoming. The Laramie Project is a breathtaking theatrical collage that explores the depths to which humanity can sink and the heights of compassion of which we are capable. 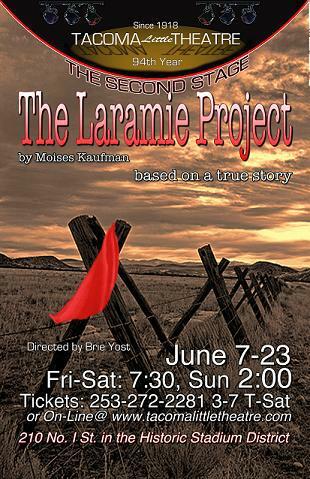 Tacoma Little Theatre is proud to end its 94th season with The Laramie Project directed by Brie Yost, by Moisés Kaufman and the Members of the Tectonic Theater Project. This production is supported in part through Arts Projects funding of the Tacoma Arts Commission. Tacoma Little Theatre is proud to host The Laramie Project Kickoff Night is a celebration of equality, acceptance, and hope in our community. The event will include a silent auction, live entertainment, delicious local food, a cash bar, and an art gallery in the lobby. Meet the director and members of the cast and design team and join in this important conversation. 50% of the night’s profits will go to OASIS Youth Center. OASIS enhances and sustains the health and well-being of lesbian, gay, bisexual, transgender, queer and questioning (LGBTQ) youth by saving individual lives, building community, and developing young leaders who can change the world. OASIS is a youth-adult partnership in which young people and adults come together for shared teaching, learning and action. OASIS is a program of the Pierce County AIDS Foundation. OASIS is open to LGBTQ youth ages 14-24. 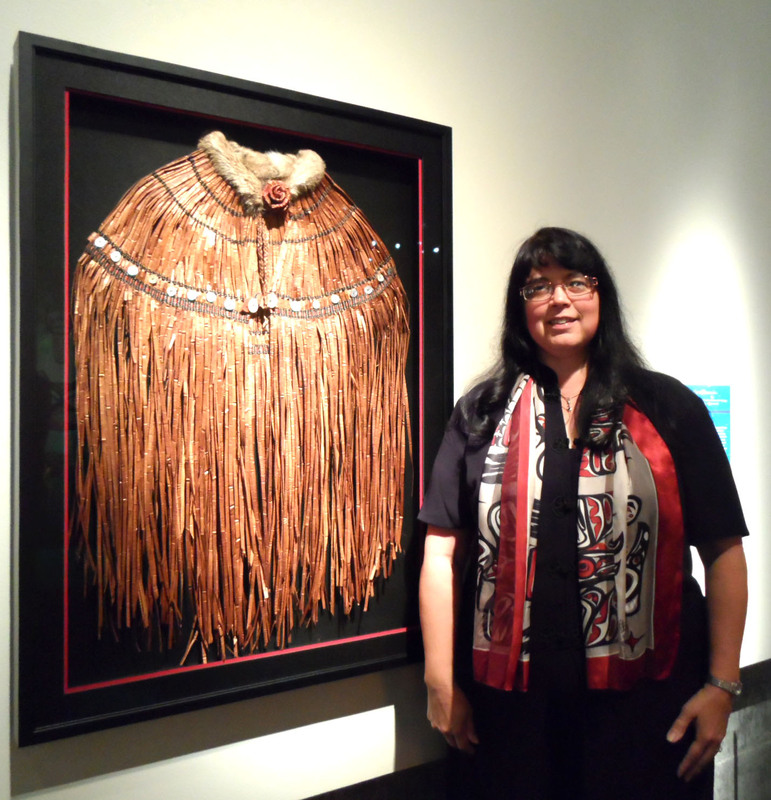 Patti Puhn poses next to her work, Ceremonial Cape (cedar bark, sinew, abalone shell buttons, rabbit fur), winner of the 2012 In the Spirit “Honoring the Ancestors” award. On Saturday, June 8, the Washington State History Museum will unveil the eighth annual In the Spirit: Contemporary Northwest Native Arts exhibit, in partnership with The Evergreen State College Longhouse Education & Cultural Center. The exhibit, which will be on display through August 18, showcases work from more than 20 Northwest Native artisans and focuses on the distinctive cultures and stories of the region’s tribal groups. The two-month exhibit will culminate with the In the Spirit: Northwest Native Arts Market & Festival on Saturday, August 17, 2013. There will be nearly 30 pieces in this year’s exhibit, including paintings, prints, basketry, sculpture, woven clothing, beadwork, cast glass, and mixed media pieces. This year welcomes an impressive eight past In the Spirit award winners and six first-time exhibitors. Each artist, representing 20 tribal groups, presents a different perspective and aesthetic. During the opening night reception on June 8, museum members are invited to view the full exhibit and discuss the works with the artists and curators. The three-person judging panel, comprised of Native American art experts and artists, will present this year’s winners in four categories at the opening reception: “Best of Show,” “Celebrating the Northwest,” “Celebrating Tradition” and “Celebrating Innovation.” A “People’s Choice” award is voted on by visitors throughout the exhibit and awarded during the August festival. When: June 8 – August 18, 2013. Tuesday – Sunday, 10 a.m. – 5 p.m., extended hours and free admission every third Thursday, 2 – 8 p.m. Cost: $9.50/adults; $7/seniors and students; free for members and children age 5 and younger. From Memorial Day through Labor Day, active duty military with valid ID can receive free admission along with up to five of their family members. The In the Spirit exhibit and festival are organized by the Washington State Historical Society and The Evergreen State College; made possible in part by the Tacoma Arts Commission, Tulalip Tribe and Nisqually Tribe, and media sponsor KUOW 94.9. Cherilynn Williams & Annie Katica Green in rehearsal for Bluebeard. When: Fridays & Saturdays, May 31 – June 15, 8 p.m.
Tickets: $14/adults; $7/students w/ID. Tickets available at the door or in advance at Brown Paper Tickets. Raised inside an abandoned church since they were babies, four women have been taught to fear the outside world. Locked in to keep them safe from an ice storm which, 25 years ago, brought the world-as they-knew-it to an apocalyptic end, the four exist in a makeshift society controlled by their tortured matriarch, Blue. This uniquely written tour de force highlights one of London’s finest young playwrights. In its west coast premiere, English playwright Pericles Snowdon’s Bluebeard explores parenthood, political subjugation, gender, the environment, betrayal, and the apocalypse. The play, while dark and creepy, is charming and engaging with a fetching touch of dark humor. Bluebeard, presented by Tacoma’s Assemblage Theater, opens Friday, May 31 and runs for three weeks. Two pay-what-you-can performances are scheduled for Thursday, June 6 and 13. Featured in the cast are Kathi Aleman, Nicole Lockett, Heather Christopher, Kaylie Rainer, Annie Katica Green and Cherilyn Williams. Bluebeard is directed and produced by David Domkoski, with original music by Stanley William. Production design is by Erin Chanfrau. “We all know the fairy tale about Bluebeard, who keeps his wives hostage, insisting that they be obedient to his will. 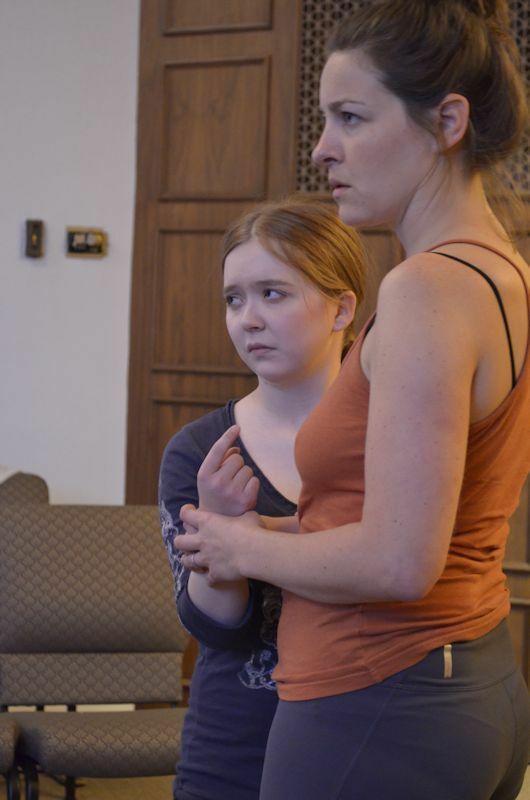 It’s clearly a tale of patriarchal rule,” said David Domkoski, the play’s director. “How do we react to the tale, however,” asked Domkoski, “when the controller is a mother bent on protecting her daughters? That’s the premise which Pericles explores in his play. As the girls’ mother asks, ‘Isn’t it better to be put away somewhere safe than to get sent out to a world without a heart. '” Post-play discussions with the cast and director are scheduled after every performance. Bluebeard was first produced in London, enjoying a sell-out run at the Old Red Lion Theater and garnering Time Out Critic’s Choice. It then transferred to New York and the Toronto Festival where it won rave reviews and the coveted Patron’s Pick award. In 2009 Pericles was selected by a panel of Radio 4 producers and artistic directors to receive the £10k OffWestEnd Adopt A Playwright award. The winning play, They Who Lay in Fields Like Beasts, was then introduced by Ian McKellen at The Theatre Royal Haymarket. Last year his memory palace play The Cat’s Mother was produced by all-female theatre company FoxedUp at The Courtyard in London, receiving 5 stars and a grant from the Arts Council. Spaceworks Tacoma is looking for a 20hr/wk paid summer intern. The Arts & Economic Development Intern will work on projects assigned by the Spaceworks Coordinator. This is an opportunity to learn about the panel preparation and selection process, as well as gain knowledge about local and regional artists and creative entrepreneurs. The deadline is next Friday, May 17 so hurry and apply! Ides of May is coming! The BareFoot Collective’s (tBFC) Ides of May dance concert is coming again, but this year it is bigger than ever! tBFC has always prided itself as being a home for movement arts in the South Sound area and in working within the community to make dance accessible to all. This year they have reached out to give their annual Ides of May dance concert a boost. Being held on Saturday May 11th, the show will be performed in the beautiful Theater on the Square, thanks to partnership with the Broadway Center for the Performing Arts. The Ides of May show is known for reaching out to bring the concepts and techniques of dance creation to high school students. In the past tBFC has only been able to bring their workshop to one high school at a time. This year, through their venue at Theater on the Square and the support of the community, tBFC is able to reach out to multiple high schools at once, bringing this unique opportunity for creation and performance with a professional company to as many youth as possible. tBFC’s collaboration for this show does not stop there. They are excited to be working with local music groups as well. Michael Hoover, co-director of tBFC, is creating a dance piece to his love of punk music, and in particular Tacoma’s own Girl Trouble. “I like the challenge of doing something different, something that challenges what is expected and what is ‘normal,'” said Hoover. Established in 1984, Girl Trouble are a main stay in Tacoma, self producing and creating music their own way. This diverse show also features the live music of Nathaniel Dybevik, original work from Serendip Dance Brigade, the choreography of Carla Baragan of BQDanza, Serena River, and dancers from PLU.